Our experienced technicians has decades of experience repairing desktop and laptop computers. Computers can fail for any number of reasons. Hardware can wear out, overheat, or just quit working. Our technicians will diagnose your systems problem for free. tell you what needs to be replaced or repaired. and how much it will cost. We can usually get your system working again for a fraction of the cost of buying a new one. We track all repairs in an online ticket system, allowing you to closely track the progress of your repair. Don’t throw away your laptop because the screen is broken! We can replace it! 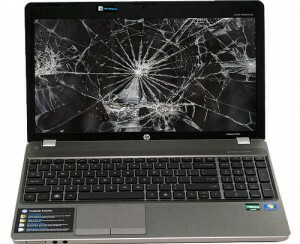 Laptop screens are fragile and can be broken in many ways – not just from falls. IT Xpress technicians can replace your screen with a brand new LCD panel and get your laptop working again. If the plastic bezel or hinges are damaged, we can often replace those as sell as part of the repair. Cost varies depending on the size of the screen and how difficult it is to swap out (some can be replaced without disassembling the laptop). We also can replace touch panels on touch enabled laptops, which can crack like smartphones, with the LCD screen intact behind it. Laptop Power Jacks are often broken when cords are tripped over. 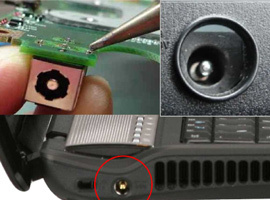 Laptop power jacks are notoriously weak, held in place by extremely thin pieces of plastic. When cords get yanked by someone tripping over them or even just daily wear and tear, the jack will often break apart, or come loose and get pushed inside the laptop. Power jacks used to be directly soldered onto the main motherboard and were expensive to repair. However, most present day laptops use power jacks that are connected via a short cable and easily replaced. The technicians at IT Xpress can replace your laptop’s power jack and also build up the supports around it to better hold it in place and protect it from future damage. Don’t let a failed hard drive ruin a perfectly good computer! Hard drives are the one mechanical device in computers – metal disks spinning at 5400-7200 RPM with read/write heads skating across them on an atomic layer of air (See this video to learn how it all works). With both electronic and mechanical parts, they can fail in many ways – shocks, overheating, wear/tear, and simple part failure. The dreaded ‘No Operating System Found’ error, or the black screen with flashing cursor are common symptoms of this. 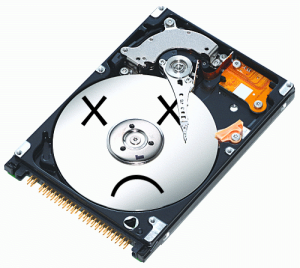 However, hard drives don’t always fail completely. They can degrade over time, causing slowdowns in performance or data loss. Let the technicians at IT Xpress bring your computer back to life! They can install a new hard drive (or faster solid state drive), reinstall the operating system, and often recover your priceless pictures, documents, and other data. When chipsets ‘overheat’ some of the hundreds of tiny solder connections under them ‘fracture’ and the laptop fails. One of the most common failures in laptops is the motherboard, namely the ‘chipset’ that ties everything together. Symptoms of this problem are usually the laptop will not turn on or it powers up with nothing displayed on the screen. The chips inside a laptop can run incredibly hot and the heatsinks used to cool them are often very small. They can frequently clog with dust and/or pet hair, causing the laptop to overheat and fail. Unlike many repair shops, we rarely just ‘replace’ the motherboard with a refurbished one (which may also fail for the same reasons). You cannot buy ‘new’ motherboards for laptops since they are custom made for every make/model. Instead we usually will have the motherboard repaired with a brand new cooler running chipset and beefed up cooling apparatus. This helps ensure the repair is long lasting. We stock many common desktop parts so we can get you back online fast! We don’t just do laptop repairs here at IT Xpress. We can repair desktops and All-In-One Macs and PCs too. Some of the most common repairs we do include new power supplies, motherboards, DVD drives, and failed network ports (lightning). We stock many desktop parts so we can get your system back up and running fast! We’re often asked if we repair broken iPhone and iPad screens. We don’t currently offer this service, but may add it in the future.